KSL results have started to spill in and we’ve had a… well kinda lackluster Ro8 if I do say so myself. Only 1 game was dropped by the semifinalists, and it seems awkward that the best match was the ZvZ. To be fair, the bracket RNG was pretty awful this time around, but at least every semifinalist is a pretty solid player. With that out of the way, let’s jump right in, shall we? Also, shoutouts to Ty2 for covering for me last month due to life obligations! Since EffOrt hasn’t really played since his ASL victory, we can only really rely on his sponmatches. Specifically, his form against FlaSh, Last, and Rain are what we want to look at to determine if his ASL run was just a one-off or has he been playing consistent Starcraft. Against FlaSh, he is 1-5 this month, not a very flattering record to say the least. But EffOrt has never really been the strongest sponmatch player, always hovering between 3rd-7th so I can’t really say much. If he has another bad month against FlaSh in sponmatches, I could see him sliding down a place. But otherwise, everything else looks good and he’s got great win-rates in ZvP and ZvZ. Similarly with the EffOrt portion, FlaSh hasn’t played offline, but he’s been excellent in sponmatches. The only blemish on his 80% across all matchups win-rate is going 0-2 against Last. Otherwise, I can’t find a reason to move him down, so he stays for now. I hope to see FlaSh playing in more tournaments to get a better feel for how he has rebounded after his loss to EffOrt, but I guess we’ll probably have to wait until the next ASL. If he has another great month of sponmatches, especially over EffOrt like the 5-1 record we saw for this month, then I might give him the nod for #1. Rain’s play in the KSL has thus far been fairly solid. His clean sweep over Where in their series, while not too impressive with the… questionable build choices from Where, still shows that he has at least improved his ability to hold off Zerg all-ins. His biggest test is still a more macro-oriented series against better ZvP players such as Soulkey or Larva, but at the very least, his play will retain him his spot at #3 over Last. His series against Leta, while funny, was not the greatest showing in Game 1, where he had a very poor read on the game and fell behind to early vulture drops. At the very least, he managed to clean the game up after Leta decided to go ghosts and nukes, but that was more Leta wanting to be a creative player and try something rather than being a more solid Terran and ending the game when he had the chance to. The expected clean sweep cements Rain at #3 this month, and a matchup against Sharp in the semifinals should mean another Finals appearance for the former SKT Protoss. Last hasn’t shown me anything that would warrant him dropping down a place. And I think that his series against Where really showed his defensive prowess in the TvZ matchup. When it all seemed lost for him in Game 1 of his Ro8 match, he managed to hold on for dear life and recover from a seemingly insurmountable deficit. The rest of that series was just another day in the office. His upcoming battle against Soulkey in a semifinals rematch from KSL1 is going to be a very exciting matchup that will really test Last’s TvZ. As mentioned in an interview with him at Blizzcon, he mentioned that watching EffOrt’s series against FlaSh allowed him to see where he can improve upon his 1-1-1 build. It is sure to be an explosive series that will be heavily watched by the viewers. Soulkey moves up a rank here for his fantastic play against Larva. What most impressed me about his victory was that after losing with his 9p against Larva’s 12p in Game 1, he continued the same route in Game 2, but made small adjustments that allowed him to take control of the series. Ensuring strong defense against the zergling attacks in both Game 2 and 3 really showed me that his BoX preparation and adjustment has improved. A grueling group stage that included a 0-3 loss to Mind is sure to see him go back to the drawing board for his ZvT, especially with Last looming on the horizon for their date in the semifinals. I do think that his ZvP looked a little weak against Mini in their first series, but he managed to clean it up in time for their final match to advance through. Being #2 in the sponmatches for the month of November doesn’t hurt either, even going 5-5 against FlaSh. Sharp has continued to be a consistent player, following his Ro8 finish in ASL6 with a semifinals appearance in KSL2. And for once, it wasn’t solely on the back of his trademark TvT, but also from his TvP. Defeating both Movie and Jaehoon is no easy feat for Sharp, whose TvP has started to look rather respectable lately. If this is any indication of Sharp’s projected future, I’m very much happy to see another Terran player who can stand up to Protoss. And the games he’s been playing have been very good, even the games that he lost. His defense against carriers obviously can improve with 2 of his 3 losses coming at the hands of the golden armada, but his all-around game looked solid. Everything from the FD, 4 fact, and standard 2-1 timing was out on full display by the former Samsung Terran. His reaver and DT defense wasn’t shabby either. His real test is obviously his semifinals match against #1 Protoss, Rain, but if he can make a series out of it, I would be pleasantly impressed. Perhaps Sharp will finally be the 3rd consistent Terran behind FlaSh and Last. Shuttle has had a quiet month since his 4th place finish in ASL. Nothing notable from him in sponmatches with a mediocre 12th place in the month of November, but that doesn’t really say a whole lot either, so he’ll slide down a couple spots to players who have been performing rather well at the KSL and are above him in sponmatches. I think he’s still better than everyone else below him, and you could make an argument with him against Sharp, but it’s fair to say that Soulkey has potentially gotten over the rut he was in and deserves to move up. Mini moves up one spot mainly because Action left the top 10 and was replaced by Where who takes the #9 spot. I don’t have Where above Mini here even though he made it into the Ro8 for a few reasons. First, Mini had to go through a PvZ gauntlet, any Protoss nightmare unless your name is Kim Taek Yong. Second, he had to play against Soulkey twice, a very strong ZvP player. Third, I still think he’s a more consistent player right now, though Where is showing that he is slowly getting better. I still think that if you had to pick Mini or Where in a tournament before any seeding is determined, I’m still going with Mini 9 times out of 10. Yes, his series against Soulkey didn’t look the cleanest with his overambitious use of in-base gateways (and he did the same a few times against Killer), but I think he’s trying things out to see if they work to understand the matchup a bit better. There are noticeable small things that he’s doing such as being very proactive with corsair scouting (Game 4 vs Killer). Overall, I’m going to give the veteran a bit more leeway this month to hold onto his spot, and I hope he returns strong for the next ASL. I think Where has performed enough to get the nod over Light in this position, especially with his victory over him in the final match of the group stage. To me, it wouldn’t make a whole lot of sense for him to be at #10 instead of #9 for this month. Does Light have the longevity over Where? Sure, but Light’s only good matchup is still TvZ while Where showed that he has good matchups in both ZvZ and ZvT. His ZvP still needs some work after getting crushed 0-3 by Rain with weird builds, but against other Protoss players, I think Where would fair much better. Perhaps it was nerves that got to him which caused him to go for questionable builds, but nonetheless, Where has been improving since his first entrance way back in ASL2. Also, it doesn’t hurt to win a good chunk of money at the Moscow LAN, beating fellow Koreans, Sharp and Shine. It doesn’t really make or break his ranking though, but it’s a nice confidence booster for him. This last one was tough between Light and Mind. I think you can make an argument either way, so really if you have Mind here and want to disagree with me on this, I’ll concede all valid points. But let’s take a look at why I think Light barely edges out Mind. Yes, Light couldn’t execute in his specialty matchup while Mind did. Point to Mind. But Light’s TvP has been improving steadily over the past month. In sponmatches, Light had solid records of 4-6 and 6-5 against Rain and Snow respectively. Point to Light. Oh and did I mention that he’s in the top 5 for sponmatches as well whereas Mind is down at #15. Another point to Light. Am I weighing sponmatches pretty heavily here? Sorta. But it’s more about the projection that I see in Light that Mind doesn’t really have. I think both of their TvT matchups are bad still, though Light managed to 3-0 Sharp in sponmatches for November. But if Light can show that his slip up against Where was a one-time thing, I’m willing to give him a pass to show me what he has next month. But he’s on a short leash. A very short leash. If he doesn’t perform next month, don’t be surprised to see him fall to CBNC. Mind: Mind played some nice Starcraft to advance to the Ro8 in the KSL, but unfortunately he hasn’t shown me anything that is new. His TvZ is still his specialty. Obviously beating Soulkey 3-0 is a very impressive feat, but his other matchups are still floundering. If he can’t show me that he can improve his weaker matchups, he won’t crack the top 10. Action: As mentioned in the November PR, Action needed to not stray too close to the sun to avoid getting burned. And unfortunately, that’s exactly what happened after two disappointing series against Where and Light, and thus he slips out of our top 10. Larva: Larva is in CBNC for a couple of reasons. I want to give him the benefit of the doubt since we all know Larva’s potential as a player. His series against Sharp and Jaehoon did not look that great though, always going to 5 games when I feel like a player of his caliber should be cleaning up a player like Jaehoon in a clean sweep. Stay on the lookout as Larva returns from his brief hiatus though, and don’t be surprised to see him return to the top 10 next month. We live in an era where we can unsarcastically say Sharp and Light are one of the top five Terrans. Wow. Even in the KESPA era Light was always around the top 5 T players. His TvZ was fantastic, probably second only to Flash. Although he's always been a much better single match player than a BoX player so he often ranked #2 or #3 for Terrans in proleague but only rarely made it past the Ro8 in individual leagues. Sharp and Light both had their glaring weaknesses though. Sharp was known for being only a TvT expert, and Light a TvZ expert. Both had a notorious reputation for being manhandled by Protoss. It's good to see them rounded more. In the case of Sharp especially his nickname was "cooked croaker" because he was easily beat and the first two parts of his name is the fish's name ('조기'석). Well if that's the case, you should be really surprised that Last is a top 3 player, he was a complete nobody during the Kespa days. for being the most stubborn player in the history of tvz. "I like wraiths, and I like harassing. Thats it"
I was more talking about the post-Kespa scene. Last hit his stride fairly early on, whereas Sharp and Light were viewed as weak until fairly recently. Even Sharp's 2nd place finish in ASL was when Terrans were everywhere and he could get by with his TvT. shouldn't your PR deteriorate or somethin if your not playing? Dunno i was fine with Flash beeing #2 after he played the ASL Finals and such, but him just playing sponmatches, however well, doesn't really warant to have no movement at all. Rain is playing a strong KSL at least. Also other questions @ PR writers: do you rank ASL and KSL roughly the same as accomplishments for the PR or do you rank ASL eversoslightly higher? 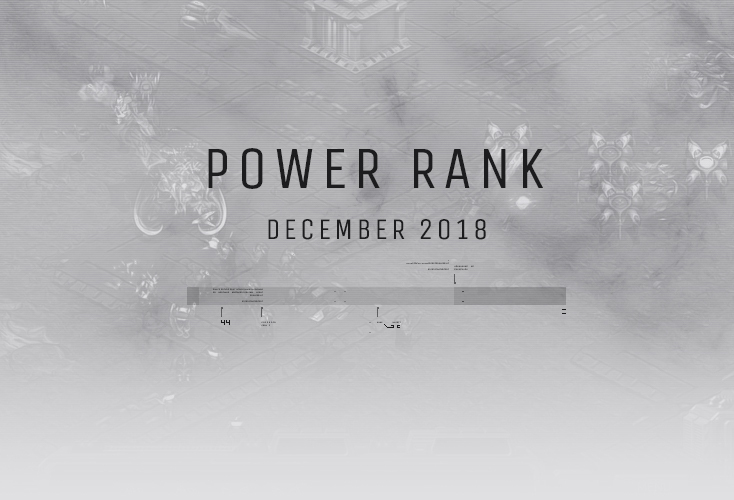 To your first part, I did that initially with the first two editions of the PR, having FlaSh not even in the top 10 because of not playing at all during the month, and slid people down a ton for not playing like Jaedong after his KSL run. People got pissed at me for that. So no, I try not to have too much deterioration. If it's multiple months in a row or if a player says they will not play mostly like Larva for KSL1 and after ASL6, I slide them further down. Can't please everyone, but this is what I've decided on. I agree that Rain has looked quite strong thus far but he's also had to play against two very weak TvP players, Light and Leta, and his PvZ wasn't really tested against Where because of those wonky builds. I rank ASL slightly higher because it is the more prestigious event and also mainly because players like FlaSh, EffOrt, Jaedong don't partake in the KSL which means the overall skill depth is a lot lower for KSL. I think the gap between OSL and MSL is smaller than the gap between ASL and KSL as an example, but if someone placed like 4th in ASL vs someone who placed 2nd at KSL, I'd still put the guy who got 2nd at KSL higher probably. But also depends on depth of tournament. Like Leta made the Ro8 for this KSL, I think that's a joke. The ASL6 was absolutely stacked. You lost EffOrt, FlaSh, Action, Shuttle, Mini and replaced them with Soulkey, Where, Mind, Leta, and Larva. If you ranked them all in order of skill so EffOrt, FlaSh, Shuttle, Mini, Action vs Soulkey, Larva, Where, Mind, Leta, every player in the ASL lineup is better than every player in the KSL lineup. So yes, ASL is ranked slightly higher. If we think of good Terrans right before SC2, I think Sharp could be a pleasant surprise but Light was always a notoriously good SPL player. There's a reason MBC Game was super good back in the day for proleague formats. But also because a lot of the Terran skill has either left or deteriorated, so we have new faces to take their spots. I think Letmelose can do something more indepth about this but before it was FlaSh, Fantasy, Sea, Light, Leta and then the next tier with Mind, Baby, Bogus, Really, Reality, etc. We had to replace Fantasy with Last, and Sea and Leta have both fallen off, so Sharp took over their spot. Bogus and TY both left for SC2, while Really and Reality I have no idea where they are now. So yeah, it makes sense to me that Sharp has risen when he was here when the post-KeSPA era started and has been readily trying to improve. His TvT is great, his TvZ isn't too shabby (he can consistently get decent Zerg kills in KCM), and he's potentially started fixing his TvP so I'm excited for him. how can you guys keep track of spon matches? is there a site with the results or you do it by just watching their streams? You can switch from korean to english by clicking an icon in the top right corner. I don't think that's right. I can't see how Where/Larva/Action should be ranked higher than him. Did I miss something? I understand it has been a while since he played but he didn't play in KSL because he expected to make a deep ASL run. I feel it is unfair to punish him like that. Also I thought the ro8 matches were good. Leta vs Rain was as fun/exciting as was promised. Leta even made (and launched) a nuke. The ZvZ was close, and Sharp vs Mind, was also a lot of fun (although TvT is my favorite matchup so I could be biased). I based this PR off of Ty2's PR. JD was in CBNC last PR so to me it makes sense for him to not be included in CBNC this PR if he hasn't played and he's also pretty far down in sponmatches too. Pretty good PR imo. I may have moved EffOrt down to the second slot, and put Flash in first but otherwise, pretty decent overall with the explanations, and movements overall.